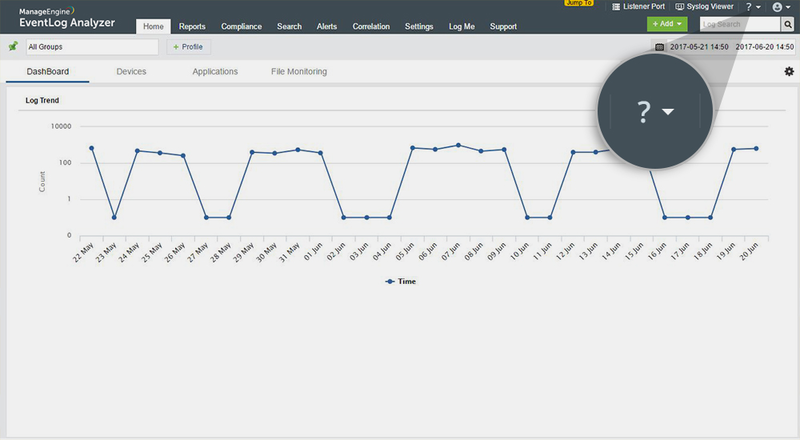 Upgrade to the latest version of EventLog Analyzer - Download service packs! We recommend our users to move to the latest version EventLog Analyzer 12.0.3 build #12030 released on March 27th, 2019. Upgrade packs are common for both Windows and Linux installations. Note: EventLog Analyzer can now be installed only on a dual core processor or equivalent. 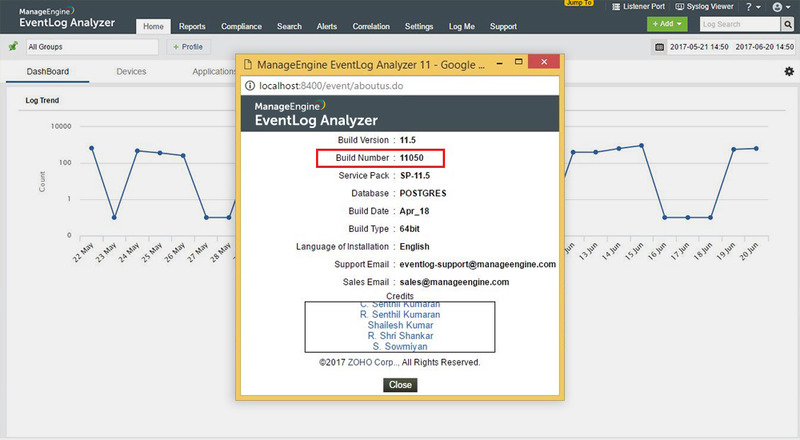 Note: Those whose first version of EventLog Analyzer is 11.21 Build 11210, please contact eventlog-support@manageengine.com to upgrade to 12.0.0 Build 12000. Download and install the Service Pack 11.20 (Build 11203). Download and install the Service Pack 11.02 (Build 11026). Download and install Service Pack 11.0 (SP-11.0) to migrate to build 11005. Download and install Service Pack 10.0 (SP-10.0) to migrate to build 10000. Download and installService Pack 11.0 (SP-11.0) to migrate to build 11005. Download and install Service Pack 9.0 (SP-9.0) to migrate to build 9001. Download and install Service Pack 8.6 (SP-8.6) to migrate to build 8066. Before starting the upgrade process, please ensure the availability of enough disk space in EventLog Analyzer server. If EventLog Analyzer is installed with root user privilege in Linux machines, then continue the upgrade process with root user privilege. Please ensure that < EventLog Analyzer Home> directory has the read/write permissions. Please shutdown EventLog Analyzer server or service. Take a backup of EventLog Analyzer server database. If you are using the Distributed Edition, please take the back up of Admin server database and all the managed server databases separately. Click here to learn the steps to back up the database. Now start the EventLog Analyzer Update Manager. For Windows: Please ensure that you running UpdateManager.bat located in < EventLog Analyzer Home> /bin directory in the command prompt with administrator privilege. To run as an administrator in the version 8000 and above, execute RunAsAdmin.exe file and then the UpdateManager.bat file in the same command window. 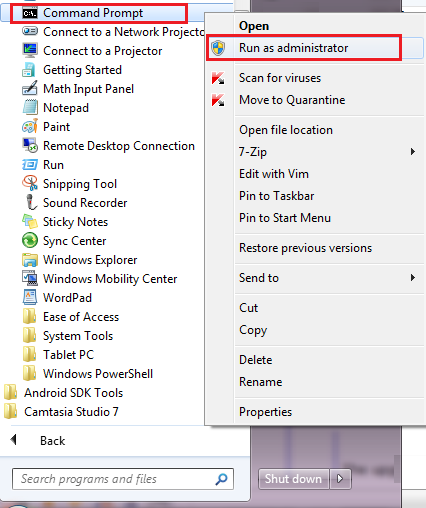 Alternatively, you can use the 'Run as Administrator' option by right clicking on the command prompt application in Windows. For Linux: Execute the UpdateManager.sh -c file located in < EventLog Analyzer Home>/bin directory. Download and install the service pack. Click 'Browse' button to select the upgrade pack file (the *.ppm file). Choose 'Install' and follow the on-screen instructions to apply the service or upgrade pack. Install the Service Pack. Click 'Browse' button to select the Upgrade Pack file (the .ppm file that you have downloaded) and choose 'Install' and follow the on-screen instructions to apply the Service/Upgrade Pack. In case if you apply more than one service pack in a go, please start EventLog Analyzer application after each service pack upgrade. Do not interrupt or revert the upgrade process. In case of upgrade failure, please contact EventLog Analyzer support team. Download the upgrade manager files from the below links and extract it to < Eventlog_Analyser_Home> /bin folder. EventLog Analyzer has updated its indexing mechanism after 8061/8062. Since index migration is a resource intensive process, we recommend you to carry out this operation manually. < EventLog_Analyzer_Home > \troubleshooting directory. For Distributed Edition, run the above script on all Managed Servers. How do I find out my current build number? 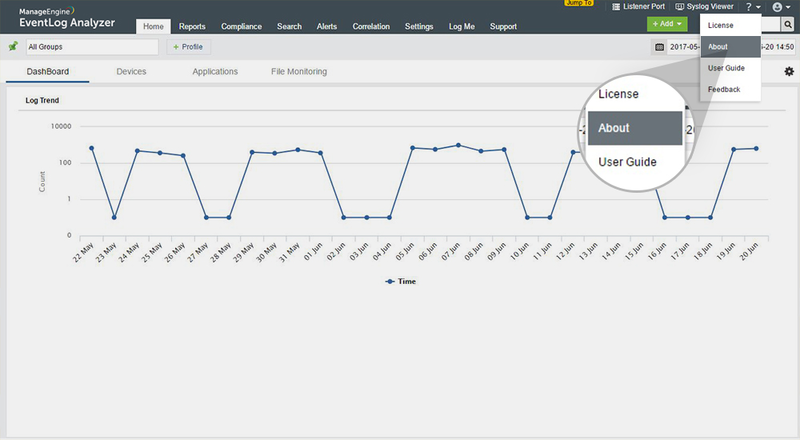 Open the 'Eventlog Analyzer' web client. A pop-up window appears containing details of your EventLog Analyzer version. You can find the build number from this window.